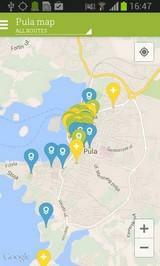 Pula+ heritage tour mobile application is a cultural guide of the City of Pula and comprises two cultural routes: Roman and Austro-Hungarian Pula, the most important cultural sightes and localities built at that time. Mobile application comprises the most important cultural points of the City, as well. Categories Pula+ and Pula+ events recommend visits to museums, galleries, theater, multimedial center and the most representative cultural manifestations.